I think I’ve set the bar high for my Reading Female Travel Writers project. My first entire travelogue – last month’s book was an anthology – isn’t just any old example of travel writing, but a classic of the genre by one of its greatest names. 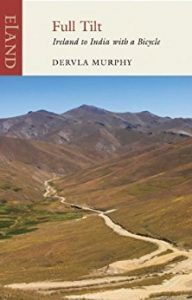 Dervla Murphy‘s Full Tilt: Ireland to India with a Bicycle is an exceptional, beautiful but above all enthralling and breathtaking story, written in rich prose yet at a rip-roaring pace. That is due to its rough and ready diary format, which I found to be both the book’s core strength and its unfortunate, avoidable weakness. The benefit of this lies in the way the narrative draws you in. Murphy lives in the moment, each pedal, each rest, each encounter, each sight, feels vivid and immediate, and you can almost feel the blast of the heat and see the breathtaking scenery in your mind as she describes it. As travel writing should do, she takes us with her, through every bump in the road and mouthful of tea. The reader tires and hungers with her, laughs with her, and is on the edge of their seat when she recounts the more hair-raising aspects of her journey. And the book is packed full of moments of drama: from wild wolves and would-be rapists, to moments of near death from hunger, starvation and unrelenting heat. Yet she also takes time in her narrative to dig deep, to reflect on and explain something of the background of the countries she is travelling through. In a testament to her mental discipline, she writes nearly every day, often exploring in thoughtful detail the context in which she finds herself. And that context is very useful, given that this was the 1960s – when Europe was split by the Cold War and the politics of the Middle East and Asia were, in some ways at least, very different. The era of Persia (as it was then) as a monarchy, Afghanistan as mostly untouched by others’ firepower, and Pakistan as a country still adjusting to its independence, feels so far removed from today, and it is at times surreal to be hearing about recognisable places in unrecognisable settings. For instance, the place names of Afghanistan – Kandahar, Herat, Kabul – are more known today for their violence than the beauty and rich culture Murphy encounters. And, poignantly for the reader, she marvels at the “immense” statues of Bamian famously destroyed by the Taliban a few years ago. That said, some of the politics is sadly familiar – Murphy writes about how the USA and the Soviet Union are already battling it out over places like Afghanistan, albeit then through soft power such as cultural engagement and structural development. Such is her insight, I at times wished for more, that she had indeed not merely presented to us her diaries more or less as written, but taken time to offer more of her reflections. That’s not to say that I would lose the rough and ready nature of the narrative, but Murphy would have been well entitled to generous quantities of leisurely retrospection without losing the benefit of her pacy, energetic story, and on the occasions she flits between narrative and philosophical content she does so seamlessly. It’s a superb and beautifully expressed sentiment, but one that she fails to elaborate on or justify, despite, curiously, describing her cycle around the mountain’s base as “one of the most glorious experiences of the entire journey”. And at the end of the book, Murphy leaves us almost mid-sentence and mid-story, with the reader hanging and unprepared for a come down, like the Road Runner suddenly realising he’s gone off the cliff. While she does explain in her foreword what she did next, I felt like the book was crying out for an epilogue to help me come to terms with no longer being wrapped up in her edge of the seat adventures. But I hope that point doesn’t detract from the quality of the book, and stands merely as a hunger for more of what she has done! Perhaps the first practical lesson from this reading exercise can be to ensure I read more of Murphy’s extensive output. Which, given Full Tilt was her first book, we might assume is even better. And while, when engrossed in the story, the reader stops thinking of Murphy’s gender as relevant, her occasional reflections on this are important points for consideration. She attempts to emphathise with women whose lives are defined (at times, destroyed) by motherhood rather than education or career, while at the same time revealing that it is often not as simple as the cliches of misogyny or claims of “backward culture” that one might often hear about. She is entirely consistent, not to mention persuasive, in her observations on the dangers of both western-fuelled industrialisation and western-led outrage about women’s rights. On a more sinister note, there are, as I wrote above, a number of man-made (should that be male-made?) threats to Murphy’s safety. Through her strength, quick reactions and handy concealed pistol she survives each unscathed, and it is worth saying that while those attacks are awful in every sense, they do not represent the worst of the injuries she picks up along the way nor do they detract from Murphy’s regular portrayals of the honorable treatment and exceptional generosity shown by all sorts of people she meets, including unaccompanied men. That she can not only undertake and survive (no foregone conclusion) such an arduous adventure over thousands of miles, then go on to write it up so beautifully, captivatingly and at times highly amusingly, is the mark surely of one of travel writing’s greats. As I’ve written before, I’d kind of heard of Dervla Murphy but couldn’t instantly think of her when I realised I’d not read any female travel writers. Not only am I now delighted to have very much heard of her, I’m quite determined that this won’t be the last I’ve read of her.